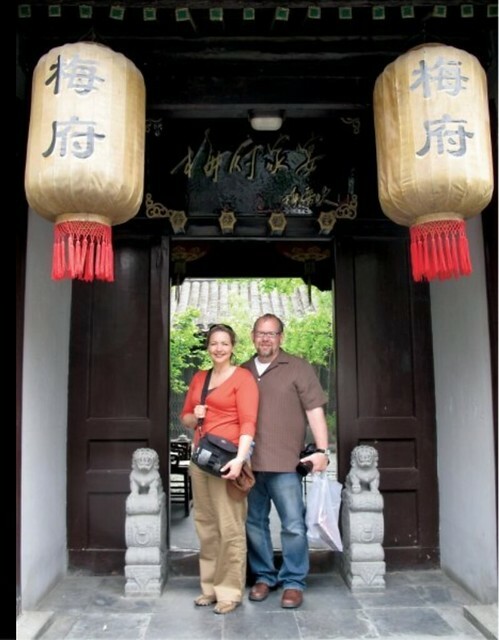 A number of years ago, my husband and I won an opportunity to travel to Asia and one of the stops along the itinerary were a few days to explore the great city of Beijing. On the first day, we were treated to some of Beijing’s Imperial-era attractions starting with a visit to Tiananmen Square which houses China’s parliament. 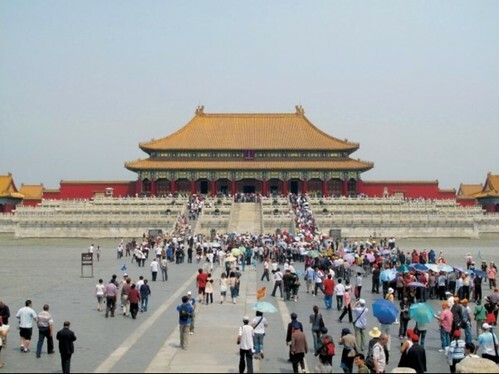 Mao’s Tomb is located at Tiananmen Square and surprisingly, there was an enormous line even to that day to see his tomb. 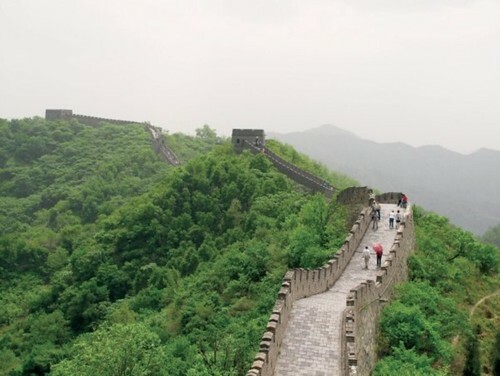 Our Eastern Journeys guide, Sophie, explained that many of the Chinese people were just starting to travel again and still want to pay their respects. Imagine a line that is 200+ yards long some 35 years after his passing! We chose to skip that line but continued along Tiananmen Square when we were stopped several times in order for local Chinese tourists to take my photo. I was even asked to join family group shots! Apparently, they hadn’t seen someone with my hair color or they hadn’t seen someone from Western culture up close and wanted to include me in their family albums! My husband was greatly amused by this. From Tiananmen Square, we walked through The Gate of Heavenly Peace and on to the Forbidden City (which sounded MUCH more intriguing than it really was). The Forbidden City was simply beautiful and sprawling. There was restoration going on while we were there and so some of the sites were not available. I was excited to see this site due to the name and yet when I saw it in person, there wasn’t anything secretive or hidden. It was just a very large, beautiful palace that formerly housed the leaders of the Imperial Era. Good marketing I say! After a humidity-drenched morning, we had lunch at a local restaurant called, My Humble House. This contemporary restaurant was blissfully air-conditioned, painted in bold colors and had the most impressive lighting made from bird cages. 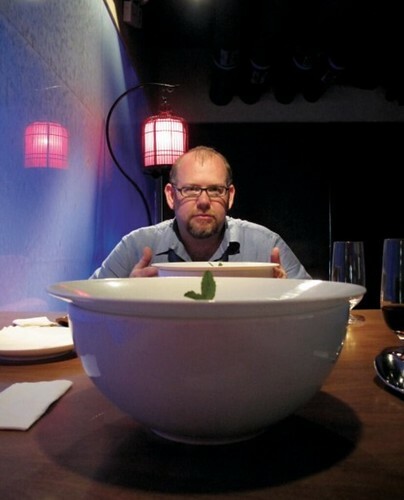 I don’t remember what we ate, but I know the portions weren’t nearly as large as this photo depicts. If I know my husband, it probably had noodles. After lunch, we drove to the Imperial Summer Palace. This was set on a beautiful lake and the architecture that remains is lovely! I remember thinking this would make a fantastic location to enjoy a packed lunch at the various picnic tables under the trees. One thing to note: the restrooms at this location are first, purely what is called “squat toilets.” Below is one from Wikipedia. You get the idea). 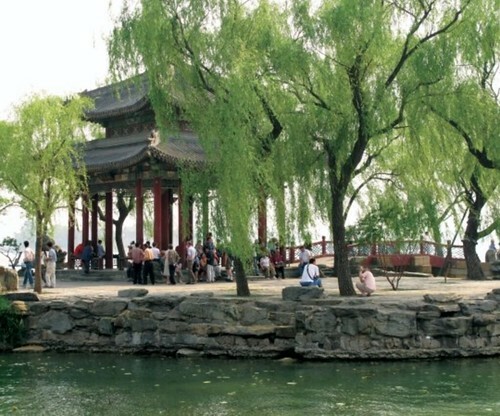 Second, think of the Imperial Summer Palace as a public park. Now imagine these toilets in the condition one normally sees in a public park. I took one look at the toilets and decided I could wait the hour drive back to the city! Another thing to note, not all Chinese toilets are the same. Some have been adapted for the western market (particularly after hosting the 2008 Olympics) some were adapted more successfully than others. 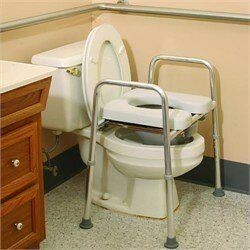 I actually found this type of toilet modification where I believe they used a very tall chair (similar to pictured above) made to assist the handicapped which sat around 3 feet above the original squat toilet and was open beneath. Yep, never wore those pants again! One last tip: always bring tissues with you. Later, after freshening up, *cough* our guide took us to experience hot pot for the first time…and we have been ruined ever since! If you have never been to a hot pot restaurant I greatly encourage you to try. The one we went to (sorry, we cannot remember the name! Hai Di Lao looks like the one) specialized in a Szechuan style which consists of very hot and spicy stock filled with chili peppers. The hot pot looks very much like a large wok. We chose to try two different stocks and how the restaurant usually accommodates this is to place two inserts in the pot: one half being the hot stock and the other half being the more neutral stock. Our guide helped us order a variety of food and then we were able to get different types of sauces from a sauce bar to dip our freshly cooked meats and vegetables in before eating. Yum! This was truly one of the high-lights of our trip! I should also mention that because we won this trip, the guide services were provided by Eastern Journeys. I couldn’t recommend them any higher! Each location we stopped had their own guides. Each guide was very personable, knowledgeable and never stuffy. Frankly, we fell in love with all of them. If a full Eastern Journey tour is not feasible, we have also hired guides just for the day in other cities via recommendations on TripAdvisor for around $50-$75. 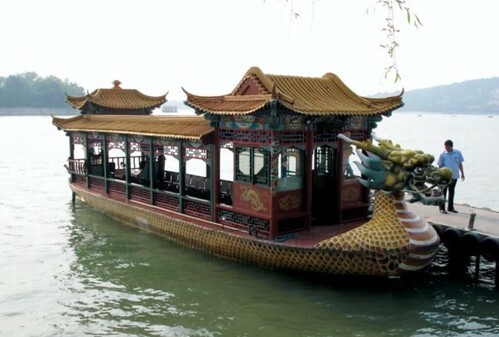 If you are going to Shanghai, let me know and I will send you the name of the guide we hired. He’s great! 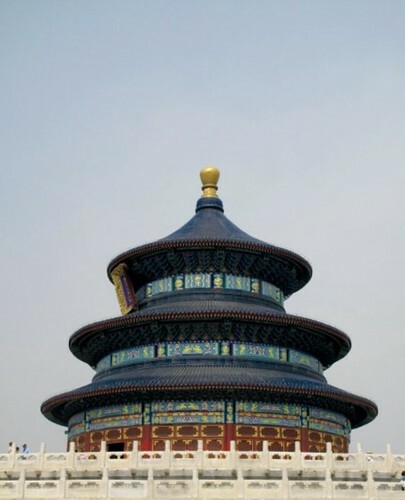 The following morning, we were told we were going to visit the Temple of Heaven. Beijing was not our first stop in China and by this point in the trip, we were a little “templed-out” and feeling not so thrilled. Trust me! You do not want to miss this experience! 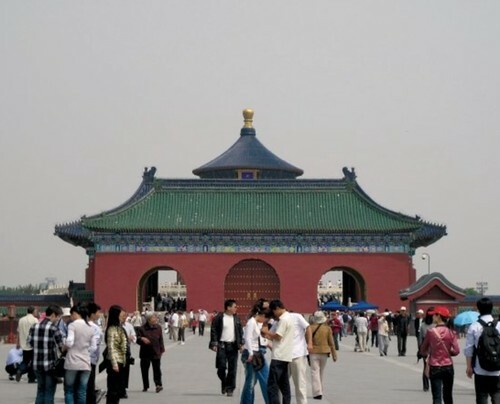 The Temple of Heaven is located on 660 acres and consists of a midevil complex of religious buildings, many that were founded in the 1400s. This complex is so big that it has a north, south, east and west gate and boasts a series of lanterns that are taller than me! But before we went to the temple itself, we had to walk through the surrounding park…which is amazing! If no one has ever told you, the Chinese passionately utilize their outdoors spaces. I was immediately overwhelmed by the sheer number of people in this park. In this one section, there was a football field-sized group of people singing Karaoke, and then another football field-sized group engaged in Tai Chi. And yet another group of the same size playing Mahjongg. The group that enchanted me was an enormous one (at least the same size) of ballroom dancers, dancing on the grass to large outdoor overhead speakers. It was an amazing site to see! I was immediately swept up by an elderly Chinese man and we waltzed a couple of songs. Truly fantastic! Once we had taken in the sites of the park, we found our way to the Temple. 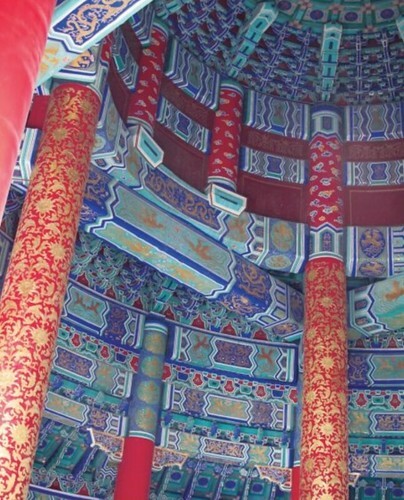 The Temple of Heaven is beautiful in design and adornment. The element that stayed with me though, was once I took in the size of the grounds that housed the temple I was able to see just how many people this must have served. Truly astounding! 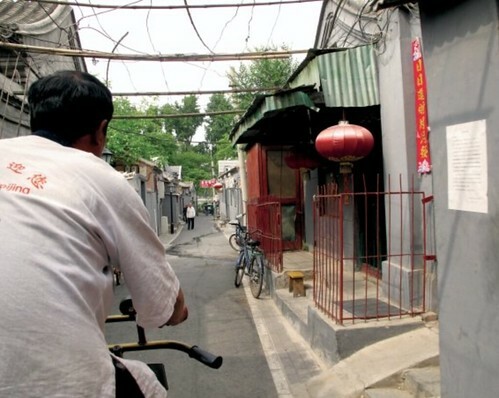 From here we took a rickshaw to the home of a woman located in the Hutong who gave us a cooking class. She shared with us some stories about her family and how her family had lived in that house for more than 100 years. 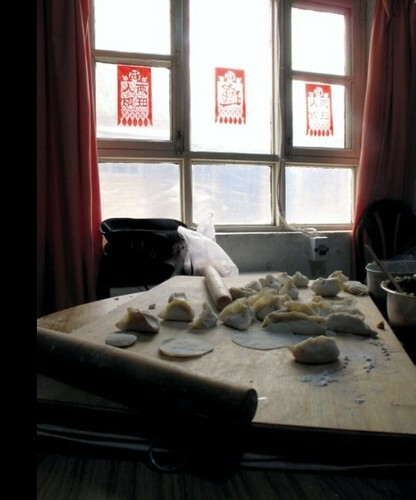 She showed us how to make dumplings and another traditional Chinese dish. We could have spent more time with her because she really took us in like family. Later, we shopped in a fun, trendy party of Beijing that was developed for the Olympics. On our last day, we went Mutianyu to see The Great Wall of China. 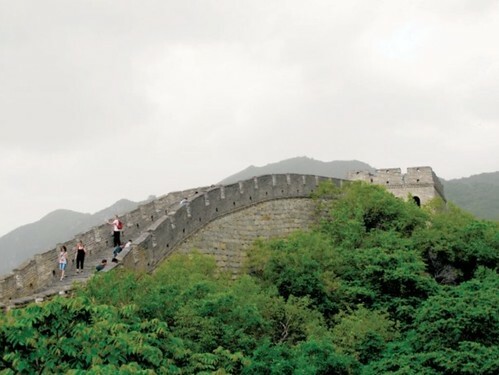 The Great Wall was originally built in the sixth century and then it was rebuilt in order to strengthen a strategic pass. It basically consists of a series of watch towers connected by a thick wall. We parked down below and had to hike up a steep cobblestone street through a gauntlet of vendors. Once you reached the top (and did a few stretches) you were all set. Tip: bring water! 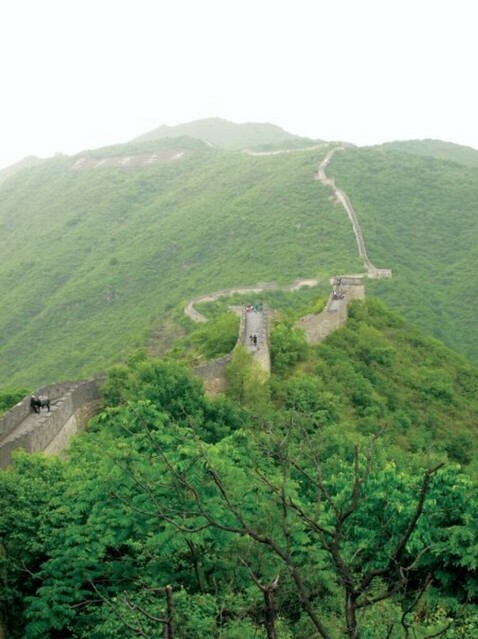 There are several different sections to see at the Great Wall: Badaling, Juyongguan, and Mutianyu to name a few. 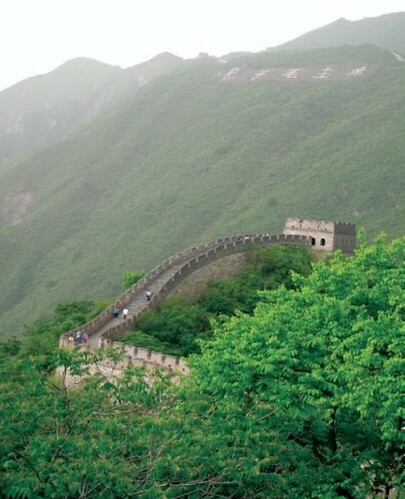 Badaling will give you great views but is considerably more crowded than the other two locations. 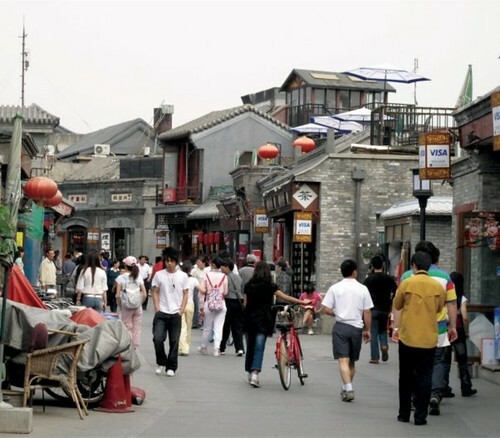 Juyongguan is less crowded but doesn’t offer as nice of views of Badaling. Still, it still is the closest section to visit from Beijing and offers impressively steep terrain as it is a mountain pass. 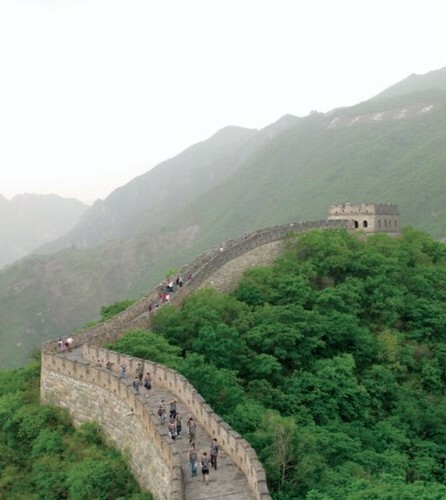 Our guide chose Mutianyu because it is less visited and we would have ample opportunity to explore the wall. And explore we did. 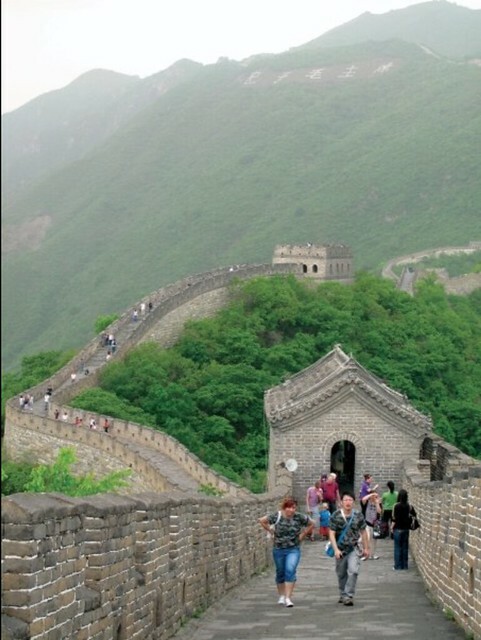 The entire length of the Great Wall is more than 13,000 miles. We didn’t even make it a mile, but took lots of photos because it truly is something to behold! 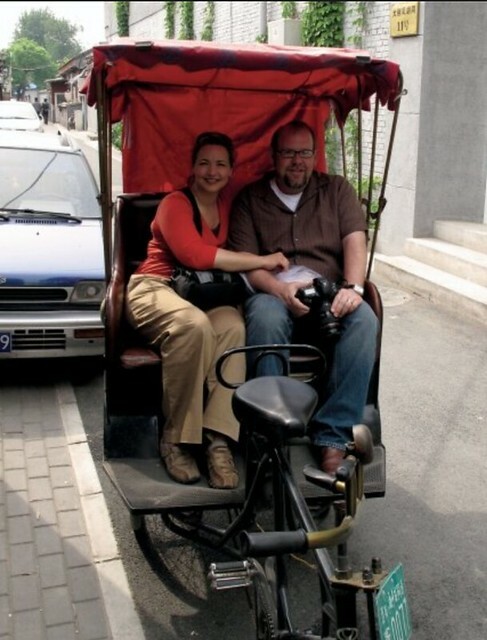 Caution: I have read that there are many travel guide vendors who seem to offer a tour for a very economic rate. Thoroughly check out anyone you would want to hire or you will end up on a bus that stops at every silk shop and apothecary offering to heal any number of ailments…for a price! 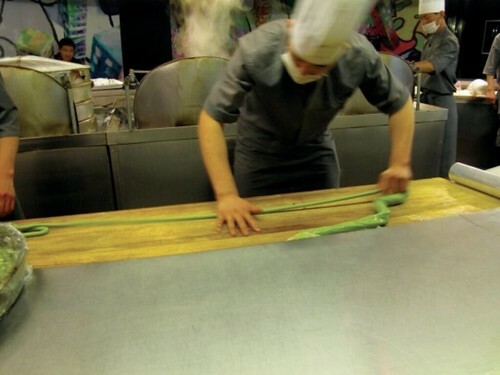 That night, we went to a noodle bar and enjoyed fresh noodle dishes. 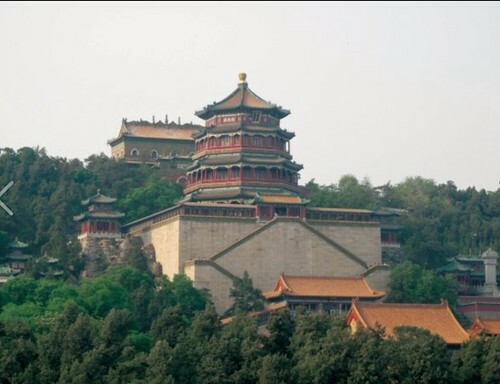 Overall, when we first arrived in Beijing and checked in to the Peninsula Hotel, I was eyeing the government buildings and wondered how much we would enjoy Beijing. I can truly say that we had a fantastic time! What an amazing account of your trip! I love hot pot through you even though I’ve never had it! LOL. The toilets…omg. I would just die! Very cool experience though! The foodie in you was thoroughly satisfied, huh? Yes! 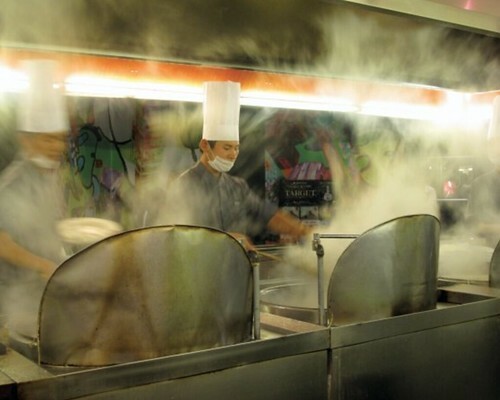 China has so much wonderful food to sample and savor. And it is nothing like the dishes found in western restaurants. It is so much better! Thanks for reading.